My son has a number of health issues. Although they are somehow linked it's best to describe them separately as that's how we treat them. 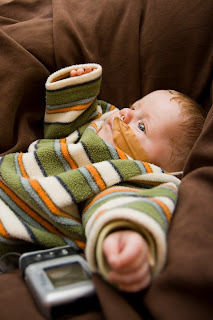 First, he was born without a pancreas. This is a rare condition with around 30 cases being reported in the scientific literature, many of whom, sadly, didn't survive. We believe there may be a dozen or more cases still alive plus any that aren't in the literature. If you are one, we'd love to hear from you!! Wikipedia gives a good explanation of what a pancreas does. Essentially it does two things, produces hormones, most importantly insulin, and produces digestive enzymes. Being unable to produce insulin means that he is diabetic. The symptoms and treatment are pretty much the same as for a Type 1 diabetic. He wears an insulin pump which gives a steady rate of insulin through a cannula inserted in his thigh. For the most part this works fairly well but, as any Type 1 diabetic will tell you, controlling your sugar levels is a constant battle which no doubt I'll elaborate on (or whine about!) in later posts. Not having his own insulin while he was in the womb meant that he stopped growing in late pregnancy as insulin is needed for good growth. He was born weighing 1.385kg (about 3lb) which is not as tiny as some of the really prem babies but with all his other problems was quite an issue. He is still very small for his age but we're trying to beef him up! Not having the digestive enzymes the pancreas would normally produce means he can't digest and absorb his food. To treat this we give him enzymes with his meals. These are the same enzymes given to cystic fibrosis patients as their pancreases don't produce the enzymes. The other organ missing is the gall bladder. This collects bile produced by the liver and releases it in response to food. As far as Finlay's health issues go this is probably the least worry and has hardly been mentioned by the medical staff. It appears losing your gall bladder isn't all that serious!! The other main problem he has is his heart. The list is: pulmonary artery stenosis (the vessel going from the heart to the lungs was too thin); atrial and ventricular septal defects (3 holes in the heart); right ventricular hypoplasia (the right ventricle is too small); patent ductus arteriosus (a vessel just outside the heart that usually closes soon after birth stayed open) and a slightly malformed valve going from the right atrium to the right ventricle. 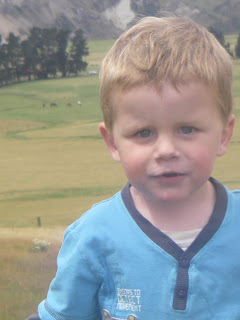 At 6 months his pulmonary artery was fixed, two holes closed and the stubborn blood vessel shut off. As for the rest we are waiting to see how his heart grows. If the right side catches up then he'll just need some minor heart surgery (if there can be such a thing!) and all will be well. If not, then some major replumbing will be needed. His heart is the big unknown for us. What happens in the next few years will determine how much his heart is going to affect how he lives his life, what limitations he will have. For now all we can do is cross our fingers and shove it to the back of our minds. For now he is healthy, his heart is stable and he is off the cardiac drugs. Long may it continue. But we've had a taste of what is to come. 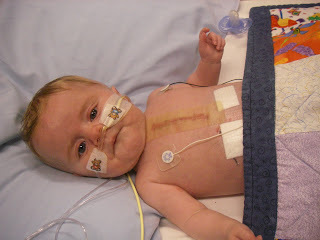 Before his earlier heart surgery he went into heart failure. Although it sounds terrifying it is actually a very gradual process, over a few months. He slowly lost strength and struggled to get enough oxygen round his body. We'd see his whole body move with each breath as his heart struggled. As he lost strength he couldn't manage to eat so all his feeds went down an NG tube, up the nose and down in to the stomach. After the operation he gained strength but the tube stayed in. 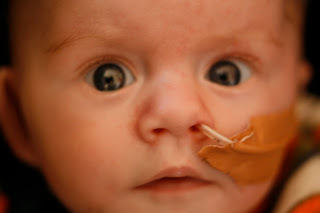 A year ago the tube up the nose was replaced with a tube straight into the stomach. He is still mainly fed through this tube. Despite all the above problems he is an incredibly happy boy who delights in running after his brothers and playing with his preschool friends. We have great hope that his difficult start to life will be a stepping stone to a full life ahead. My son is type 1 diabetic too. Thank you so much for sharing your amazing inspiring story. Donna, Mom of Fred, 13.